Taste of The World 2018! Join the Student Government Association’s Social Affairs Committee as they celebrate cultural expo “Taste of the World” from January 22nd- 26th, 2018. Quick Announcement: This week, January 22nd- 26th, the Student Government Association’s (SGA) Social Affairs Committee is hosting a cultural expo called “Taste of the World,” featuring foods from all over the globe. This week-long event includes explorations of world cuisine, calligraphy, dance workshops, a film screening of Fruitvale Station, an open-mic night interspersed with performances by dance troupes Evolution, Riddim, K-Pop and many more! There will also be a panel addressing several types of art featuring Christal Brown (Dance), Damascus Kafumbe (Music) and Marissel Hernández-Romero (Spanish & Portuguese)! 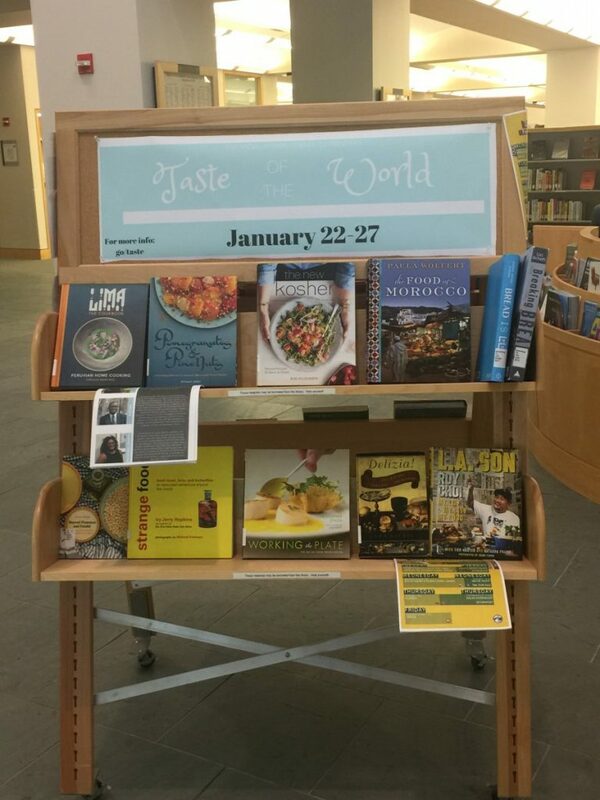 For more information, see the event’s Facebook page at go/middlebury.edu/taste and stop by the Davis Family Library to see this thematic display! Event Contact: Adiza Mohammed, adizam@middlebury.edu. This entry was posted in Midd Blogosphere, music and tagged cuisine, Dance, display, film, film screening, Food, Library News, libspotlight, LIS Staff Interest, lisblog, Middlebury Community Interest, MiddPoints, movie, Post for MiddNotes, Post for MiddPoints, Student Government Association on January 22, 2018 by Katrina Spencer.